The world’s widest synchrotron x-ray beam is now operational in Melbourne, following a period of intensive development. The new x-ray beam is the life blood of the Australian Synchrotron’s upgraded, high-tech, imaging and medical beamline. 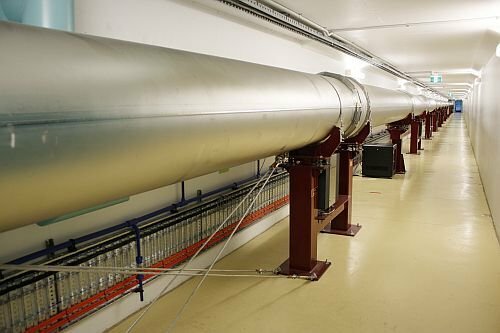 By the time it reaches the end of its 140 metre path, in a purpose-built satellite building, the imaging and medical x-ray beam can measure up to 4cm high by 50cm wide, making the world's widest synchrotron beam available to researchers. Many of Australia’s top medical and biomedical scientists are already preparing to use the new facility, which will boost Australia’s capacity in key research areas such as bone, cardiovascular, heart and lung health, and radiotherapy (including microbeam radiation therapy (MRT), along with associated radiobiology and dosimetry). Research streams have been identified in consultation with clinicians as well as biomedical and clinical researchers. The bone research stream, for example, draws on the combined expertise of surgeons, oncologists, veterinary surgeons, MRT specialists and the synchrotron beamline team, and is focused on in-vivo high-resolution imaging and MRT for musculoskeletal diseases. The power behind the new beam is the ‘silver wiggler’: a $1.3 million superconducting multi-pole wiggler magnet. Located inside the synchrotron storage ring, the wiggler magnet array delivers the very high energy x-rays required for radiotherapy research. The wiggler was supplied by the Budker Institute of Nuclear Physics in Siberia, and installed and commissioned in late 2012 by a large team of Australian Synchrotron and external experts. This beamline upgrade was largely completed in-house. In addition to playing a major role in installing and commissioning the wiggler, staff also designed, constructed, installed and upgraded the required x-ray beam conditioning and filtering equipment, as well as a large-diameter, evacuated pipeline to safely and efficiently deliver the beam through the transfer tunnel to the satellite building. Andrew Peele, Interim Director of the Australian Synchrotron, congratulated principal scientist Daniel Häusermann, principal beamline development advisor Kia Wallwork and other members of the IMBL team, and the dozens of support staff who contributed to the upgrade, including mechanical and electrical technicians, mechanical and controls engineers, safety personnel, procurement and stores staff, for making this keenly-awaited achievement a reality. 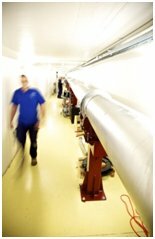 Left (and above): The transfer line for the imaging and medical beamline delivers a 4 cm x 50 cm x-ray beam to a sample 136 metres from the source. Below: Medium-resolution CT reconstruction of the vascular structure in a rat heart (left) / lung (right). Images: James Pearson, Daryl Schwenke, Mikiyasu Shirai and Alberto Astolfo.